PEEK-A-BOO DINOSAUR LOVES TO EXPLORE. And he's in the right book. 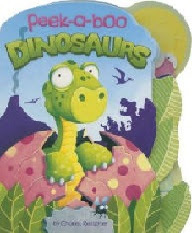 The eyes have it in Charles Reasoner's Peek-A-Boo Dinosaur (Die-Cut Animal Board) (Picture Window/Capstone Press), with one critter or another peeking through the die-cut windows on each page of this shaped book. Jeepers Creepers! Where'd they get those peepers? Big dino and tiny ladybug eyes peer through through the peepholes, and green, gold, and pink dinosaur twins pop out to say "hello." We're talking STURDY in the case of this board book for the youngest, with holes for little fingers to poke and pages stiff enough for little fingers to learn to turn. A shaped book with page edges cut into the lines of the jungle foliage, it's a good place for a baby dino to hatch and a good place for little eyes to go exploring.